The Airport Rail Link, ARL, is an express and commuter rail that provides the link from Suvarnabhumi Airport to the centre of Bangkok. The ARL consists of three surface railway lines; most of them are on viaducts. Two of the lines provide direct service from the airport to the capital, whereas the City Line trains make stops en route, which makes it therefore a commuter service too. All trains leave from the first level of the airport terminal. The convenient connection has been active since 2010, and is the quickest way to reach the city centre. The journey with the City Line takes about 30 minutes, the two Express lines take even less, about 18 minutes. 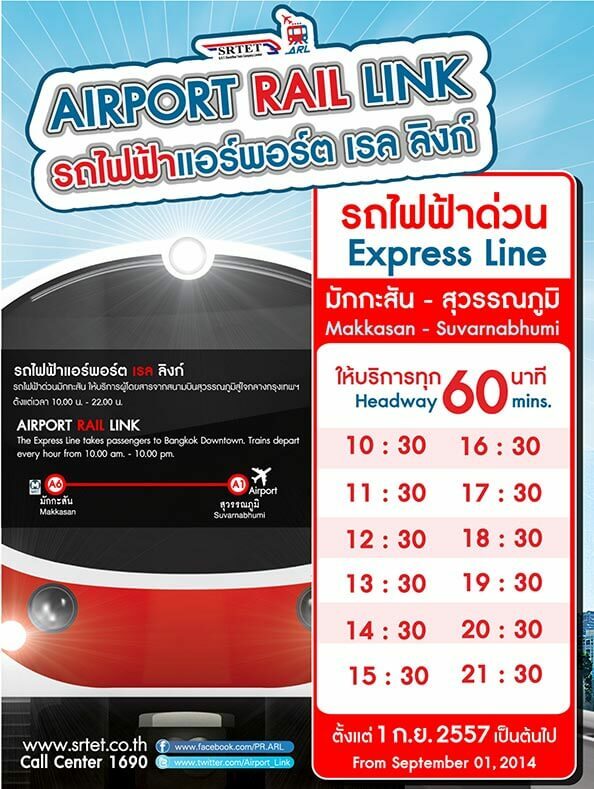 The Airport Rail Link operate from 06:00 to midnight every day. The cost is 150 THB for roundtrip, 90 THB for one-way. The City Line trains arrive at Phaya Thai Station in Bangkok, making stops at Lat Krabang, Ban Thap Chang, Hua Mak, Ramkhamhaeng, Makkasan, and Ratchaprarop en route, with departures from Suvarnabhumi Airport every 12-20 minutes. The Sky Train Station of Phaya Thai, BTS, is within a comfortable 100-metre walking distance from Phaya Thai Station. The Phaya Thai Express Line departs to Phaya Thai Station every 30 minutes, with non-stop rail service. The Makkasan Express Line is also non-stop, with departures to Makkasan Station every 40 minutes. The metro station of Phetchaburi, MRT, can easily be reached on foot and is situated about 300 metres away from Makkasan. Note: The two lines expressed at this time are suspended, due to a shortage of rolling stock, perhaps will be reactivated with supply of the new trains ordered. Convenient, reliable and safe, Bangkok Transfer Services provide a comfortable ride to the airports as well as other major destinations in and out of Bangkok..